Some days get hard. The pressures of life can start to feel like a struggle. Maybe we’ve been waiting on an answer to the prayers we’ve been praying. Yet God’s timing seems off. We start to wonder if He’s even listening, or if He really cares about all that concerns us. We may feel stuck in difficult situations. We just don’t know what else to do. 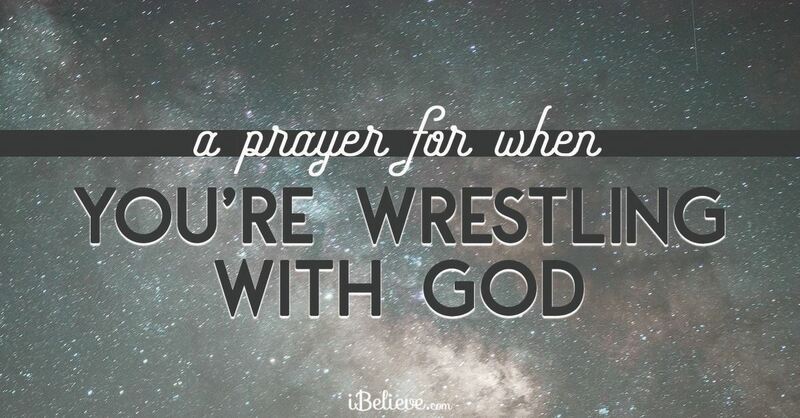 If you’re wrestling today, in your thoughts, in your heart, and peace seems far away, press in close to Him my friends. He is near to all those who are crushed in Spirit. He gently reminds you He is faithfully leading, even in the most difficult of times. He will carry you through all that He’s purposed in His heart for your journey in this life. Often our greatest battles are more about what is unseen than what is seen. We may not fully understand why everything has happened the way it has this side of heaven. But we can be assured that God is a light-bringer, a hope-giver, and He will use this trial for great good, both in our lives, and in those around us. We come before you, humbly and broken, for our spirits are heavy and our souls can find no rest outside of your Presence. We need you Lord to show up strong on our behalf right now. We’re tired of wrestling, we’re weary in the struggle of it all. We don’t understand what you’re doing, we can’t fully wrap our minds around your ways, but our hearts cry out to you for help and peace in our time of desperate need. We proclaim again, that no matter what we face, we trust you, Father God. We know that your plans for us are good and filled with hope. We know that you have the best in store for us, even though our circumstances seem too hard to bear right now. We believe that this storm won’t last forever. We know that light will break through the dark. And we have confidence in you to bring us through. "You alone see the big picture..."
God, we confess to you that sometimes our worries seem too big. We don’t see a way out of our current situation, and your timing seems different than what we would have chosen. But we know and believe that no matter how much we’ve struggled, you alone can see the big picture. And we praise you, that you are with us in it all. Help us to hear your voice through the difficult days. Help us to set our eyes on you alone. Help us to keep moving in the direction you are leading us. Thank you for your reminders that through every weakness and hard place, your strength is displayed in beautiful ways through our lives. We can’t do it on our own Lord. We’re so freshly aware of that. But you can work your great miracles in us, and through us. Thank you that this battle will never have the final say over our lives. And because of your power and compassion, we will come through to the other side, with greater perseverance, stronger faith, and deeper awareness of your presence with us. Thank you that you are fighting for us, and will bring us out as gold. Many men and women in the Bible who loved God dearly also had moments when they struggled with what He was doing in their lives, and in the very purpose of what He was calling them towards. It isn’t always easy to follow through with Gods’ leading. We see only a small glimpse of the whole big picture that He can see. And yet His word reminds us that our thoughts are not always His thoughts, and that many times, our ways are not His ways. Jacob wrestled with God (Genesis 32:22-30). Moses questioned God’s plans in his life (Exodus 3, 4, 5). David wondered why God seemed far away (Psalm 13, 22). John the Baptist faced doubts about who Jesus was (Matthew 11:2-3). Jonah ran from God’s calling (Jonah 1:3). Elijah battled great fear and discouragement (1 Kings 19). Hannah cried out to God in desperate grief (1 Samuel 1:10-16). Job struggled in pain and terrible loss (Job 3). Sarah laughed at God because of the timing of His plans (Genesis 18:10-15). Jesus prayed through the night in deep anguish (Matthew 26:36-46). And the list goes on. The truth is, God is never unloving towards our struggles with His will and ways. He understands. He longs to bring peace to our fears and security to our doubts. He never asks us to figure it all out on our own, but simply to trust Him, and to recognize His leadership and Sovereignty in our lives. Often, that’s a choice - to keep trusting. But in it, are found the keys to lasting soul-rest and joy, for He promises to be with us, and to make our pathways straight. The burdens you find yourself carrying aren't meant to be shouldered by you alone. Lay them down, and lean on Him. He promises to bring peace to our souls when we bring our cares to Him. He gives peace and strength to overwhelmed souls, and rest to the battle-weary. He's at work on your behalf right now, lining out pathways, smoothing out the road ahead, working through every burden and care, working out miracles as only He can do. So you can let go, and move forward in His fresh power and strength.